Rich Rodriguez was named the Head Coach of the Michigan Wolverines on December 1th, 2007, he would become the replacement of Lloyd Carr who announced he would leave the Wolverines after the season. Rodriguez left the team he played for in college, it was a surprise move on his part, because he signed an extension with the team the year before. He's bringing a very good offensive scheme to the Wolverines, although he doesn't have the pieces to perfect it yet, he looks to build it through some heavy recruiting this up coming season, it also hurt when Pryor chose to sign with the Buckeyes instead of the Wolverines. Rodriguez has a career record of 104-62-2, and the Wolverines expect big things from him, not necessarily in his first year though. He has been named the Big East Coach of the Year twice (2003 & 2005), he was also named the NAIA Coach of the Year in 1993. He also won 4 Big East Championships with West Virginia as well. ANN ARBOR, Mich. -- Former West Virgina head coach, Rich Rodriguez, has left the team, and decided to take the job at Michigan instead. You may ask why Rodriguez left West Virginia, the main reason was because of his relationship with the athletic director at WVU. The Wolverines have high hopes for Rodriguez, they love his explosive offensive scheme he brings to the team. The next day Rodriguez was interviewed by college football analyst, Kirk Herbstreit. KH: Congratulations on the new job, Rich, let me just ask you this, if you don't mind, why did you leave West Virginia, and take the job in Michigan? RR: Well Kirk, I got an offer I couldn't refuse; Michigan is a great school, and I love the history there, I'm really looking forward to coaching there next season. It kills me to leave West Virginia, I have great relationships with all the players there, and I hate leaving especially before a bowl game, but I feel it was best for the school if I left, and took my services elsewhere. KH: The Wolverines have a lot of seniors graduating, who will take part in the NFL Draft, so what do you plan on doing next season, and how do you plan on filling the holes of the players that are leaving? RR: It definitely hurts to lose leaders like: Long, Henne and Hart, not to mention a couple other players, but I'm confident in the squad their leaving me with, I mean, it's not like were not going to be recruiting, because evry year I'm here, were going to be a top 5 recruiting class, and that's a guarantee; 10 minutes after I was hired I spoke to Terrele Pryor, and he's considering Michigan now, which is great because he fits the next offensive scheme perfectly. KH: Thank you for you're time Rich, congrats on you're new job, and good luck with the up coming season. RR: Thank a lot, Kirk! LITTLE ROCK, Ark. -- Former Michigan Quarterback, Ryan Mallett, will transfer to Arkansas, after playing his Freshman year at Michigan. Mallett started 2 games for the Wolverines, and won both of them. Mallett transfered to Arkansas because he loves the opportunity to play for Bobby Petrino, and he doesn't like the new offense that new head coach Rich rodriguez brings to the Michigan team, becaus ehe doesn't fit it, so he probably wouldn't get a lot of playing time. Mallett will be playing college ball in his home state, and he loves that opportunity as well. Mallett won't be eligible next season, so the senior Houston Nutt will be the starter until he graduates. did you make those articles yourself? delpanator23 wrote: did you make those articles yourself? Yea, although I looked at some articles of the same topic, but I still made up most of it. PENNSYLVANIA -- Top Quarterback recruit, Terrelle Pryor, a native of Pennsylvania, has commited to "THE" Ohio State University, over their rival school, Michigan. This move shakes up Michigan's plans for next season, as they had high hopes for Pryor to come in and be their starter, becase he fit perfectly in their new offensive system, the spread offense. This now forces a problem for new Head Coach, Rich Rodriguez, because he doesn't have a starter that can excel in the offensive scheme, because the planned starter for next season before Rodriguez was hired. They already lost a Quarterback in Ryan Mallett, who transfered to Arkansas two months ago, so this is the 2nd Quarterback the Wolverines have lost. This works out great for Ohio State, they get a stud in Pryor, and they effect Michigan's offense in a negative way. What will happen with Michigan? "It was an extremely tough decision, really, but with everything I've considered, I chose Ohio State, because I think it's a betterr fit for me, and what I want to do with my career. I wanted to go to a school that also presented itself with a good basketball program, and OSU has that as well. I know I may not be starting, but I like the competition my freshman year presents me with, I'll be competing against a great college Quarterback in Todd Boeckman, who lead his team to the National Championship last season. I hate saying no to Michigan, because I really think I can excel and look good in their offense, but I have to think about my future, and when I'm a junior and senior, I don't want to be labeled as a "system" QB, because that can cause my draft stock to go down, and me miss out on some money, which I need to support my family with. I'm happy with my choice though." Where'd You Go; I'll Miss You So.... Much! 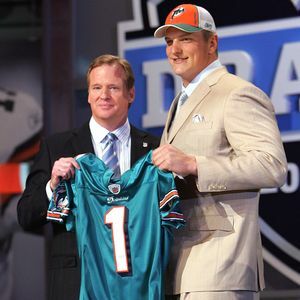 NEW YORK -- The 2008 NFL Draft took place, and the #1 overall pick was an alum of Michigan, Jake Long. Jake Long will serve as a huge loss to the Wolverines program, Offensive Tackles like him don't come around often. Long was a huge loss, but he wasn't the only guy who left for the draft, they also lost 4 year starting Quarterback, Chad Henne, who also went to the Dolphins in the 2nd round. Other notable losses for the Wolverines include: Running Back Mike Hart, who always put 100% into every play, and he also had a great carrying ability, he rarely fumbled, he was selected by the Colts in the 6th, a great Receiving tandem in Mario Manningham, who has great speed, and has a lot of explosiveness, he went to the Giants in the 3rd round, and Adrian Arrington, he was selected by the Saints in the 7th, a Linebacking tandem in Shawn Crable, who was amazing last season for the Wolverines and went to the Patriots in the 3rd round, and Chris Graham, I'm still not done, a Safety tandem in Jamar Adams and Brandent Englemon, along with a Guard who was also good in Ada Kraus. That's a total of 10 starters who have left the Wolverines, it's going to be tough to replace every single one of them next season. All of them will be deeply missed by the University of Michigan, and the players who played with them. I've got free weeks from Week 1 to Week 4, but I would prefer to use Week 2 (you play Miami Ohio, I play Citadel). Let me know. iavikefn wrote: I've got free weeks from Week 1 to Week 4, but I would prefer to use Week 2 (you play Miami Ohio, I play Citadel). Let me know. That works for me. I'll change my schedule. I want to play week 1. MainEvent- Fresno State wrote: I want to play week 1. I'm playing Clemson. I still have weeks 3 and 6 available, but I'd rather not give up 3 because I'm playing Notre Dame. Chalk me down for week 3. You want home or away? MainEvent- Fresno State wrote: Chalk me down for week 3. You want home or away? Sorry, but I don't really wana give up that game. Quarterback is a huge question mark for the Wolverines this up coming season, they have three Quarterbacks dueling for the starting job, those thre candidates are: Steven Threet, David Cone and Dave Sheridan, Threet is a redshirted freshman, Cone is a redshirted sophomore, and Nick Sheridan, who is a junior. None of these QB's have ever played a down in their college football career, so they all are inexperienced. Threet looks like the frontrunner, at the moment, he doesn't fit the offense, as well as every other QB Michigan has, but he has very good arm strength, he's also very consistent with his accuracy, and he has decent size, he needs more speed, obviously. Sheridan is small, but he has the most speed out of the 3 QB's, although his arm strength and accuracy needs improvement. Cone has good size, and he's very productive, bu noone knows if he can cut it as the starter, he was only a 3 star recruit coming out of college 3 years ago. Right now it looks like Threet is going to win the job, but if he doesn't do in the first couple of games, look for Sheridan and Cone to get some starts. At Running Back the Wolverines have a lot of decent backs, but not that one great one who can make big plays. The starter looks like it'll be Brandon Minor who was their 2nd string behind Mike Hart last year. Minor is a junior, he's a Marion Barber type back, he can break tackles, he has a lot of toughness, and very good vision, although he doesn't have amazing speed, but it's decent. The 2nd string looks to be Carlos Brown, another junior, unlike Minor he has very good speed, and he has good vision and alright size, but he won't break a lot of tackles, he goes down easy. Minor and Brown can be what most call "thunder and lightning", Minor provides the thunder, Brown provides the lightning. The 3rd string will be Kevin Grady who was redshirted last year, and is now a junior, he was a 5 star recruit coming out of high school, he's a decent back, he just has better competition in front of him. There is also Avery Horn, who is a redshirted freshman, he has blazing speed, proven by his 4.4 40 coming out of high school. They are all talented guys. At Wide Receiver the Wolverines have a huge sleeper as their #1 in Greg Matthews, he is a junior who has great size, and good speed, he should especially excel in redzone situations. The Receiver starting alongside Matthews will be Junior Hemingway, a sophomore who is a great downfield receiver, with very good hands and body control, along with good concentration, one major thing he should improve is his speed, he'd burn a lot more people downfield if he was faster, he's not really elusive either. The 3rd string will be a freshman, Darryl Stonum, like Hemingway, he is another downfield threat, he has great speed, proving that by running a 4.4 40, he is a great runner, he possesses great vision, balance and he has a quick burst. although he needs to improve his route running. The 4th string will be a redshirted junior, Laterryal Savoy, he has decent size and speed, and should be a solid #4. The final receiver that will be on the Wolverines will be Joe Conover, who is pretty much only on the team because he already got redshirted, but he does have decent size, and he had a 3.7 GPA in High School. 3 receivers are projected to get redshirted for the up coming season, all of them sophomores: Zion Babb, Toney Clemons and Jim Potempa, who was originally a Running Back. The starter at Tight End will be Carson Butler, who was also the starter last season, Butler has decent size, he's a good blocking Tight End, and also a good recever as well, with decent speed. Mike Massey will serve as the backup for the 2nd straight year as well, so nothing has changed here, Massey is a good blocker. Both of these players were defensive ends in High School, so their both physical, too. Sophomore, Martell Webb will be redshirted. -, has good body control, he can drive blocks, he also has good: size, speed, technique, and aggression. At Right Tackle will be Mark Ortmann, he is strong and doesn't le tmen beat him, on occassion, he played Tight End in High School, so he has decent speed. The backup for Schilling will be Perry Dorrestein, he has great size, standing tall at 6'7 and weighing 305 pounds, and he's pretty fast for an Offensive Tackle, his 40 time was 5.25, his biggest strength is his pass blocking, but he's not shabby at run blocking either, he has good feet as well. Too ba dhe won't really get an opportunity to be the starter, because Shcilling is a sophomore, and so is he, so he'll prbably be stuck behind him for his college career. The backup for Ortmann at Right Tackle is Braynt Nowicki, who is 6'9 and 326 pounds, only a 2 star prospect, so he won't be anything more than a backup, although he does have amazing size. At Guard the Wolverines have Cory Zirbel, who will play on the left side of the line with Schilling, whch will be a great side to run to, Zirbel has great feet, long arms and moves very well. The starting Right Guard is Tim McAvoy, he has good speed, as he played Tight End in High School, and he has decent size. Zirbel's backup is Mark Huyge, who is a mobile and athletic lineman. The backup to McAvoy is also Huyge, so he's versatile as well. Eevery Guard has been redshirted, the starters are juniors, and the backup, Huyge, is a freshman. Finally, the starting Center is David Moosman, he's a redshirted junior, he has great strength, he likes using technique, which he's improving on, he also has good quickness. The backup to Mossman is redshirted freshman, David Molk, he has good footwork, and he has a lot of toughness, and he finishes his blocks, he has a chance to become the starter. 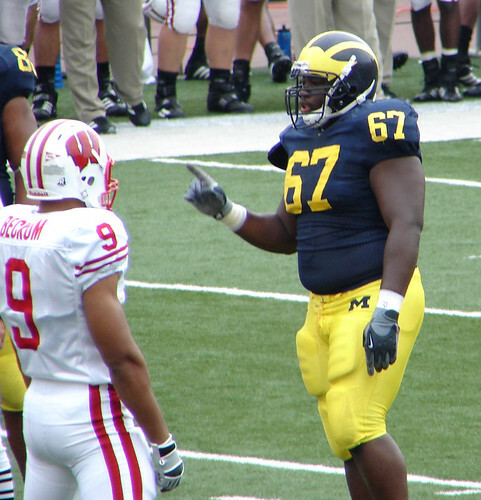 This Wolverines' defense is a pretty underrated group, we'll start off with the Defensive Ends. One starter will be Tim Jamison, a senior, he has very good speed for a DE, and he can rush the QB, and come up with sacks. Starting alongside him will be Brandon Graham, he was a five star recruit coming out of High School, as a Linebacker, so he has decent speed, he's very aggressive, he can lay down a hit and he has good instincts. There will be 3 backups at DE, Greg Banks, a redshirted sophomore, he is a fantastic pass rusher, and he has outstanding work ethic, he also has good size, at 6'4, another backup is Adam Patterson, he's versatile, because he can play DT as well, and he has good strength and size, the last backup will be Ryan Van Bergen, a redshirted freshman, he has great size, at 6'6-265, and he plays with good intensity, and always give a good effort, meaing he plays with a high motor, he can be versatile as well, DT may be a position for him, because of his size, he has a good first step as well. There will be one redshirt, senior, Tim North. At Defensive Tackle, there's Terrance Taylor, who is a great Nose Tackle, he's strong and can always get to the ball carrier, he racked up 100 tackles as a freshman... in High School. The other starter is Will Johnson, who has great size, standing tall at 6'5, he's a senior, along with Taylor. There will be 3 backups, like DE, one will be John Ferrara, he has good speed, and is very consistent, he's a redshirted sophomore, another is Andre Criswell, he has amazing speed for a DT, he is also redshirted, but a junior, the last is also redshirted, a sophomore, Jason Kates, he has good: size, quickness and strength, but he needs to give a better effort. There will be one redshirt, sophomore, Renaldo Sagesse. One of the starting OLB's is Austin Panter, he's a senior, and he has very good leadership skills, which he is going to have to use throughout the whole season. The other starter is a redshirted sophomore, Obinna Ezeh, he has very good speed, and athleticism, he played RB in High School. Starting in the middle will be Jonas Mouton, a 5 star recruit, like Ezeh, he is also a reshirted sophomore, he is very good in coverage, and he is a great tackler, he needs to improve his awareness and instincts, though. Bakcing him up is Marell Evans, a sophomore. One of the backup OLB's is John Thompson, a senior, he has good speed, the other is Brandon Herron. One of the starters at CB is Morgan Trent, he has amazing speed, proven by him being ont he track team, he is a very good coverage corner, and he has good hands, he use to be a WR. The other starter is Donovan Warren, a sophomore, he has good feet, hips and a good burst, along with great speed, he needs to improve his tackling ability, though. The nickel back will e a senior, Doug Dutch, he has great speed. Finally, the dime back will be Troy Wollfolk, a sophomore. One of the starting Safetys is Brandon Harrison, he has good feet, hips, and excellent technique, along with good speed. Starting alongside him will be Steve Brown, he's physical, can lay down a hit, an dis also athletic, with good acceleration and quickness. The two backups will be Chris Stewart and Michael Williams, who has good speed and quickness, and can read a defense very well. Sophomore, Artis Chambers will be redshirted. Week 1, Clemson invades the Quietest 106,201 People in America and trounces the Wolverines, 28-10.
iavikefn wrote: Week 1, Clemson invades the Quietest 106,201 People in America and trounces the Wolverines, 28-10. You wish! I'm really looking foward to our game. im not going to play clemson until that #7 RE with 91 speed leaves, that just spells trouble, ill play them in 2010 when the QB, RB's, and RE is gone. same with florida, not til 2010 when harvin and tebow are bye bye..
start trying to get a game scheduled with kiwi for friday so you can play right away. did you get ahold of Kiwi, you guys need to play right away when you get to your dads. also if you cant what time did you wanna play because if i see him online today i can just tell him for ya. delpanator23 wrote: did you get ahold of Kiwi, you guys need to play right away when you get to your dads. also if you cant what time did you wanna play because if i see him online today i can just tell him for ya. He said he's free from 1-7 PM CT, so I'm hoping he'll be online. I'll be online from about 5:30-5:45 EST, so if he's on just message him to stay on in that time range, I may be a little later thatn that, or even a little early.